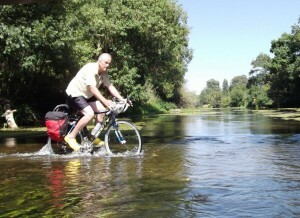 Croc Monsieur: Meet Adam Ruck, The Man Who Cycles in Crocs! It’s amazing who you meet on Twitter. 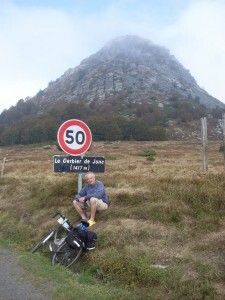 Through my @llamamum account, I happened across Adam Ruck, author of France on Two Wheels. As a keen cyclist, I’m always interested to find out about fellow cyclists so I contacted Adam and asked if he’d write a guest post for me. And here it is. Many travel books start as a publishing or fundrasing idea, and most travel articles start as that ghastly word, an angle. 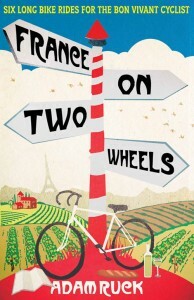 Others develop out of a real holiday or journey, and my book, France on Two Wheels, falls into that category. A friend rang me to say he was looking for someone with whom to ‘bicycle’ (he does hate the word ‘cycle’ unless applied to washing machines or the economy) to or from Switzerland. I agreed to the return trip. Drawing a straight line from Lake Geneva to the nearest ferry port at Caen took us over the Jura to Arbois, through Burgundy to the Loire south of Orleans, and northwards from there to Chartres, the Normandy Beaches and home. Neither of us had done a long bike ride before but we knew France well enough to recognise a mouth watering itinerary, with wine tasting in Arbois and Burgundy, favourite monuments like the pilgrimage church at Vézelay and the cathedral at Chartres, and a succession of rivers to swim in and beautiful landscapes to cycle through. The ride took us just over a week at a rate of about 100km a day. Six hours of cycling between 9am and 7pm left five hours for lunch, river bathing, seeing things, resting, arguing at cross roads and not arriving until 8. When I wrote an article about the ride so many people said ‘what a lovely thing to do,’ that I hatched the idea of a book of bike rides through France. In truth, it is not so much a cycling book, as a celebration of the delights of the old-fashioned French touring holiday, as traditionally undertaken in a car, bowling along empty country roads, enjoying good food and wine in family-run hotels, and a little light sightseeing between meals. 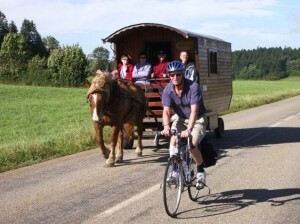 Most holiday cyclists stick to one area – typically the Dordogne, Burgundy, or Loire chateau country. However, my friend and I like the sense of travel that comes from riding a longish way in a straightish line, with changes of countryside, cheese and wine. It makes the bike ride seem like a journey, and I wanted my routes to have some geographic, historical or practical logic. Paris to Provence; down the Loire; a medieval pilgrimage route to the Pyrenees; a ‘descent’ (or so we imagined) from the Cevennes to the Atlantic, following sections of the Tarn and the Lot. I have tried to make the account of our rides readable. With little essays on things I find interesting, and a selection of good hotels, I hope the book will be a good companion for anyone who enjoys exploring France, by bike or in a car. When planning their rides, cyclists obsess about hills, and my friend and I are no different. ‘450 vertical metres, bloody hell, is it too much for us, can’t we find a flatter way …’ and so on. In the end, the hill is never as bad as you fear. It is the wind that saps your morale. Hills do not go on for ever, but a headwind never lets up. It keeps blowing you backwards, and eats in to your soul. One of the reasons we enjoyed our bike rides so much is that we were drawing our own lines across France. When we came upon dedicated cycling trails, as we often did because France has a growing number of them, we did not follow them with much enthusiasm, and on the one trip that coincided with a cycling trail more or less from start to finish – La Loire à Vélo from Nevers to the Atlantic – we found it quite annoying. We were forever looking for it or losing it or fretting about whether or not we were on it, or ought to be. When the surface deteriorated we would think: damn, we’d be better off on the road, how do we get there? Basically, we were happier pottering along normal back roads in the old-fashioned way, and the heretical thought did occur to us that all these cycle trails have been dreamed up by motorists to rid their roads of pestilential cyclists. Independent travellers who dislike being told what to do, we sometimes wonder what use we would make of our own book. I don’t think we would follow it slavishly. One reason I have not joined up the dots between the points on the maps of our routes, which I have plotted in some detail on the book’s website, is that the little roads we chose between the fixed points on our itineraries may not be the best. I’m sure readers will enjoy getting the map out, as we did, and finding their own way. A cycling holiday ought not to be complicated. The enforced simplicity of the activity is what we enjoy as much as anything, and the idea of jumping on the bike on the spur of the moment, heading for France, and riding south, booking nothing and staying wherever you happen to be at sundown has great romantic appeal. But it isn’t practical. If you are using the train to get to the start and/or back from the finish of the ride, and you are at all price sensitive, you need to book tickets months in advance; and if you are travelling long distances on fast trains, transporting the bicycle is not as straightforward as it might be. Then, if you take the view, as we do, that a good dinner/B&B (however you define it) is a key part of the pleasure of travelling in France, that takes planning and needs reserving. If it ever was true (as I doubt) that every French village of substance had a reliably good hotel-restaurant, it certainly isn’t true now. I think we would take my book with us when we were driving through France in case we were passing through any of its places – for wine tasting, eating or staying the night. We would dip into it, tinker with its suggestions, and I think we would find it useful. We would also enjoy reading it, and reminding ourselves of the huge fun we had on our French bike rides. A huge ‘thank you’ to Adam for such an interesting post and for suggesting the title of ‘Croc Monsieur’. 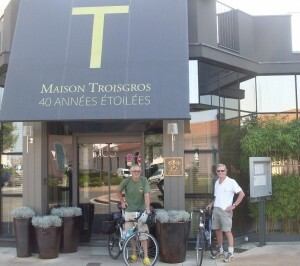 To recap, you can find details about France on Two Wheels at www.france2wheels.com. The book is published by Short Books @ 8.99. Chicken Fest: Exposition Nationale d’Aviculture at Gueret Logging Blog And Wacky Warning Signs!